Tim and I were walking over to the Fort Collins Bike Co-op for its Bicycle Month Kickoff Party when a black-and-white two-wheeled beauty caught my eye. But unlike the others I have been noticing in the last couple weeks around Old Town, this one was not a bicycle. Instead, this was the type that Arthur Fonzarelli would be rumbling around on. A Triumph motorcycle. But unlike the 1949 Triumph TR-5 that the Fonz favored, this one was thoroughly modern. 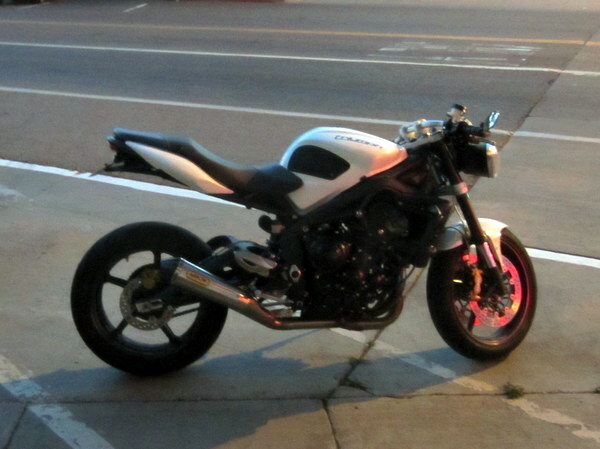 I figure it is a 2010 (+/- 1 year) Triumph Street Triple that has been only slightly modified. Custom touches seem to include an Arrow 3-in-1 exhaust (a $1200 factory option?) and bar-end mirrors. At first I thought it had some fairings removed, but looking at the official website for a 2011 Triumph Street Triple, most likely not! And the specs are impressive: 105 bhp out of its 675cc three-cylinder engine, and yet it still yields 51 MPG on the highway (33 city). I absolutely love its clean, naked streetfighter looks. If I had to find a replacement for my Buell today, this would probably be it. I think the Fonz would approve.